As we know by now, fashion and trends often go from one extrem to the other. For years and years all you could see during fall and winter were dark boots, either black or brown. For this winter quite the opposite is the case. 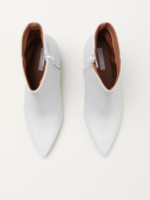 White boots are totally on trend and it is a trend I love. Like black boots they go with anything and they give a little freshness and a twist to an outfit. The downside is that I’m not quite sure yet how to keep them as clean as they are now in this cold and muddy whether. I’m pretty sure at some point someone will be spilling red wine or some food on my shoes which will make me go mad lol. My intention never really was to buy white boots. They popped up when I was looking for black ones, as pretty much every year. They come in size 35 which is rare. I couldn’t resist and ordered them and I’m so glad I did. Having small feet can make it difficult to find the boot that has the perfect fit. Either they fit on the feet but not on the legs or the other way around. These ones are perfect. I’m not surprised though as Massimo Dutti is an Italian brand and they often have small shoes and small clothing. I kept the outfit minimalist as I wanted my boots to be the center of attention. However, like I said, white boots go pretty much with any outfit you would be wearing black boots with. 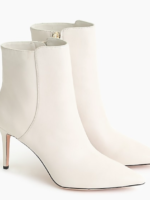 There is one thing though you should consider when buying white ankle boots. Wearing black socks becomes really obvious. Just something to be aware off in case you don’t like to show off your socks. Below I’ve put together some of my favourite white boots.